Boscia is a fairly new brand in my skincare routine. I fell in love with one of their cleansers so I was excited to also try a moisturizer. The new Tsubaki Glotion is unlike any other moisturizer I've ever used. It provides a gorgeous, healthy glow before you even reach for your highlighter! If you have oily skin like I do, this moisturizer will be well-suited for under makeup or nighttime use. It definitely gives a luminous glow to the skin, but it's a bit too much for my oily skin on its own. Instead, I like wearing it underneath light/medium coverage foundations and BB creams for a subtle luminescence. It really gives a beautiful, radiant effect. Plus, this way I can control the shine on my skin. I also like wearing this moisturizer at night so its natural oils can nourish my skin while I sleep. I love incorporating a product that serves multiple purposes into my beauty routine. Sometimes I don't reach for highlighters but still want my skin to look healthy, glowing and luminous. This moisturizer helps me achieve that without adding an extra step! Even on my most minimal days, I moisturize and just put on a bit of BB cream and this Tsubaki Glotion adds just the right touch. 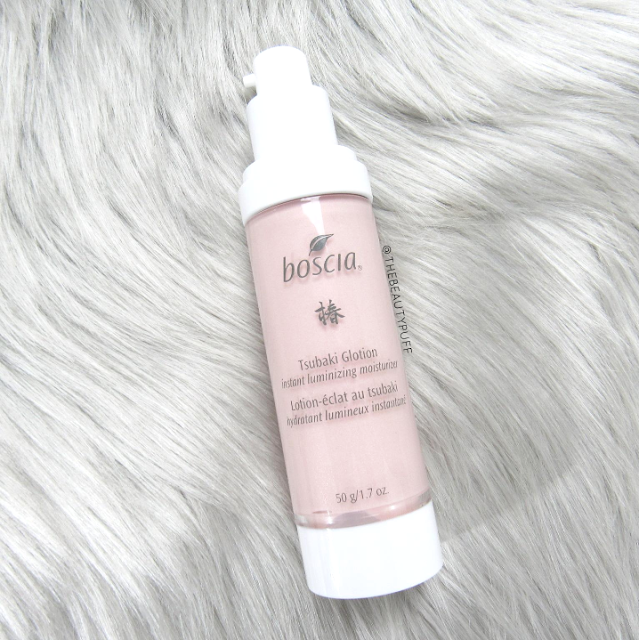 You can find this along with other Boscia products at Sephora or their website below!